We produce unit IGNIJET 2007 since February 2007. CAN protocol for datalogging is disposable from April 2009. CAN hardware has got all units IGNIJET 2007, but so far they don�t make messages for datalogging. We can exchange firmware in older units. We can unfortunately exchange firmware only by ignijet. Bit rate is 500k, for bikes Aprilia it is 250k (reason is, that CAN is shared also for messages to original dashboard). Frequency of messages is 10Hz. Hardware is high speed CAN (PCA82C250T is used). 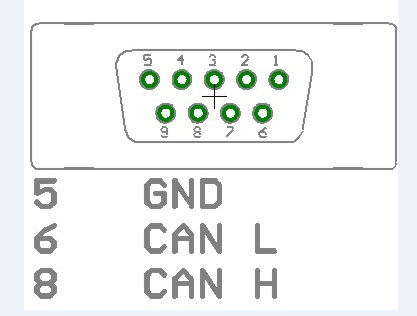 CANH is on pin 8, CANL is on pin 6, GND is on pin 5 in 9pin data connector. There is terminal resistor 180 Ohm between CANH and CANL. CAN on unit Ignijet 2008 is same as on Ignijet 2007. Unit Ignijet 2007 Ducati has low speed CAN, bit rate is 125k. Data structure is same as on Ignijet 2007. Older units (Ignijet 2004 and Ignijet Max Power) hasn't CAN hardware - it is not possible for CAN connection. This units upgraded with software Ignijet 2007 is not possible for CAN connection too.